Hillary Chybinski: take some time. . .
take some time. . .
to just be. . .
i seem to forget that advice these days. i feel as if i am going a million miles an hour from the minute i wake up until my head hits the pillow at night. i feel like i'm snapping at everyone and everyone and everything disappoints me because my expectations are so high. . .it's not a real happy place - and i'm trying to get out of it. i know in the logical part of my brian what is important. . .
i know the things that drive me crazy - clutter and a never-ending to-do list are not important in the 'grand scheme" of things. . .but they catch my focus. 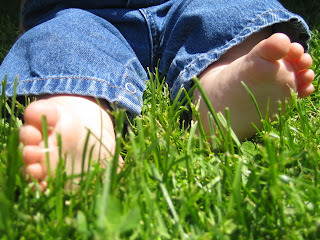 and i forget to look at tiny little feet and toes, wiggling in the green grass of spring.